If any of you are part of the 30-day Winter Cleaning Challenge group on Facebook, you’ll know we’ve been busy organizing and deep cleaning our homes. 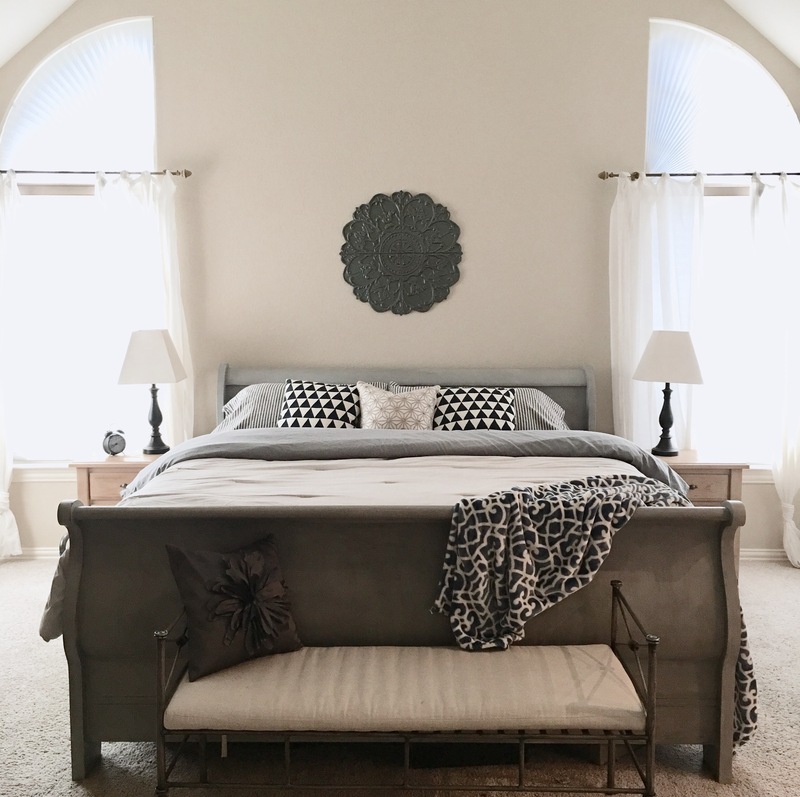 Last week I worked so hard on my master bedroom that I just had to share a few pics! I found our bed on Craigslist and refinished it. (See earlier post.) The lamps are also a Craigslist find. We bought the nightstands and bench 16 years ago after purchasing our first home. The curtains are from IKEA. The wall medallion is from At Home. The bedding is an assortment from Pottery Barn, Bed Bath and Beyond and Target. I love old windows! I found this one for $10 at a flea market in McKinney. The candlestick was found at a consignment store, and I’ve had the glass vase forever. The boxwood greenery was a gift from my sweet friend B. Miss her to death!! It cracks me up that we have a giant TV in our bedroom… but it is what it is. I’ve tried to decorate around it with these yard sale find candlesticks and flea market find greenery. About 4 years ago we realized that we needed more bedroom storage. 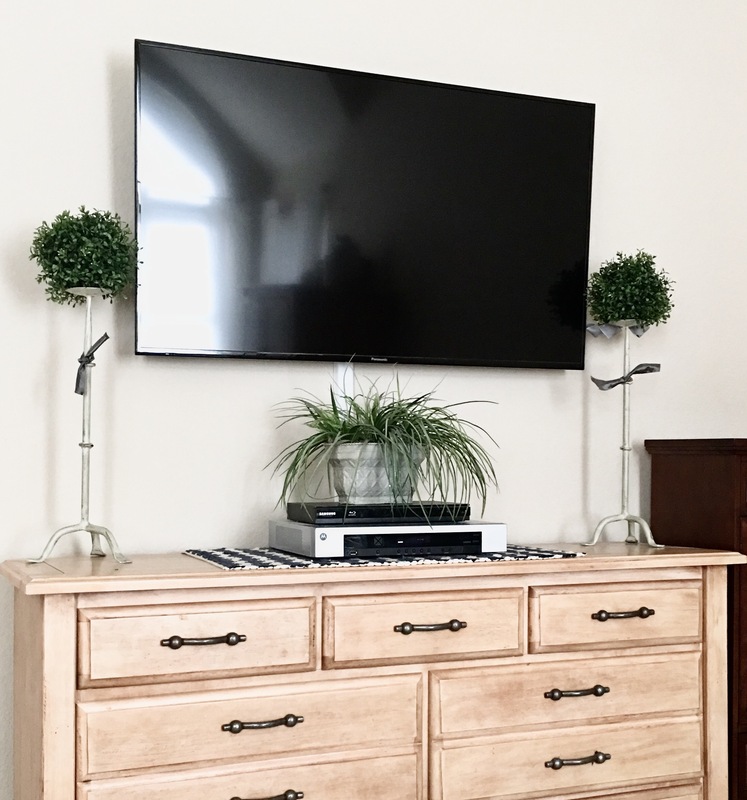 I scanned Craigslist for 5 months until I found the matching dresser to our bedroom set! 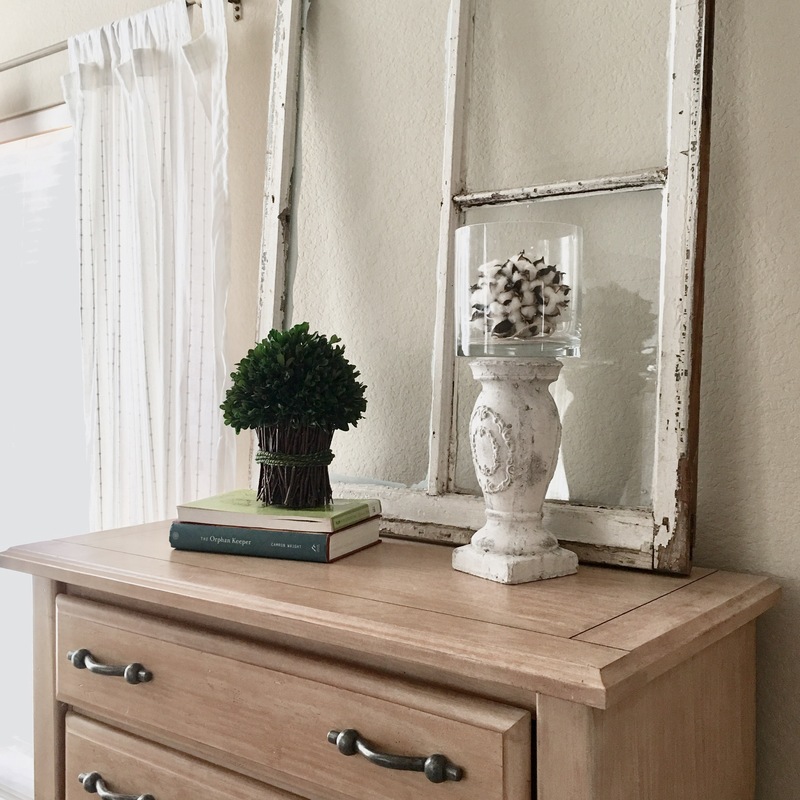 It came with a mirror that attaches to the dresser… but why put the mirror up, when the TV shows so much more? You can also see the corner of my walnut wood jewelry cabinet. It was a sweet surprise gift from my hubby 3 years ago and I love it. But I think he was hoping that eventually I’d agree to dark furniture in our bedroom, and that we’d be replacing all the furniture soon. That began our ongoing Bedroom Furniture Banter. I’d like to paint everything white, and he’d like to buy all new dark wood furniture! We haven’t found a happy compromise yet but we’ll get there! Thanks for taking a sneak peak at my bedroom today!! Ha ha! I love your story about your bedroom furniture banter! Your bedroom looks so yummy and clean. You’ve really made it a sanctuary. Thanks!! It’s always tough to keep it super clean like this… but when it is, I love it! Thanks for teaching me how to clean a bedroom!